Even the slightest inconvenience is enough to get your blood boiling during your morning commute. So, you can imagine how pissed a whole bunch of drivers in Phoenix were when traffic came to a standstill during the rush hour on Interstate 17 early Monday. Then again, it's tough to imagine they'd be able to get too worked up once they realized the cause of the snarl: a pack of six objectively adorable dogs on the loose. Traffic was all but stopped along Interstate 17 at Grand Avenue, where a pack of doggos were on the loose, roaming from the median across several lanes to the shoulder near Thomas Road right in the middle of the Monday morning rush, according to AZCentral. The whole episode was captured on video thanks to some Arizona Department of Transportation cameras, and it plays out like a long-lost deleted scene from Homeward Bound (minus Sassy). 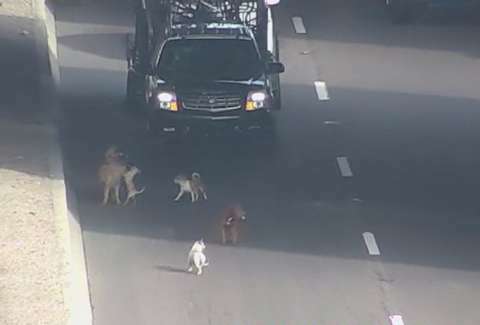 It's unclear exactly how the six pups, each of which appear to be of a slightly different breed, got onto the highway in the first place, but they seemed somewhat unfazed by the goings on around them. In fact, you can see them pause to play in front of the lineup of stopped cars like they were just chilling in someone's backyard. Fortunately, a small motorcade from the Department of Public Safety was able to wrangle the pack off the highway unscathed, and corralled four of them into a fenced-in area. Animal control is still on the hunt for the other two dogs, which remain on the loose. Authorities are also still trying to figure out who the four-legged friends belong to. There are certainly worse reasons to be late for work.